Hello, and welcome to my home! I'm beyond excited to share it with you all today, and show you what we've done with the place! We built and moved into our home over three years ago, with the expectation that it would be our first family home. We were lucky to find out a few months after that we were expecting our first child. It was such an exciting time for us, and we have enjoyed this home just as we had hoped. I only recently, as in the past year and a half, have been able to really sit down and figure out exactly what we needed in our home, to make it functional for our family. Can you guess what I found out? We needed more storage! Haha! With a whole extra person, regardless of how little he is, we found we were lacking functional storage for all that came with him. Since, we have figured out ways to add that storage, with a budget in mind of course so we had to get creative in some places, and finding ways to use other décor items as storage for our everyday items. I hope as you tour our home you get some inspiration for your own, and if not, that you at least enjoy what you see. Let's get started! Designing the entryway to work for our family sort of just fell together without a lot of fuss. We like to have a space to store our shoes, bags, jackets, and keys, so anything beyond that is just opportunity for me to play, and so I have. With a few quick changes of décor the space has taken on an inviting carefree beach feel. It very well may be my favorite transformation in this space yet! Our Home Office was recently made over into a beachy crafting space that doubles as a kids space for our son. I've completed a few blog projects since the makeover in this room, and it's so wonderful to have a dedicated space to do it. I can easily walk away from it all and come back as I feel, without having disrupt our everyday routine. We've also had a wonderful time watching our son play in the space. His scribbles are getting to be so intricate they are sure to be the MOMA soon, so be on the lookout! The living room has also been refreshed for Summer. Can you tell I like to decorate? Haha! It's not necessarily magazine worthy, but sometimes I have to pinch myself to see if I'm dreaming or if it's all real. I am most at home in this space. Maybe it's because the family spends the most time in here. It's easily accessible, and spacious, so it gives my son a lot of room to run and play inside, when it's too hot to be outside. Some days, okay most days it looks like a toy bomb went off in here, but we know that just means it's being loved, so it's okay. Our kitchen and dining room are connected, since we have chosen to use to oversized breakfast nook as our dining space. To keep the flow throughout the space, I have chosen to place live plants throughout the space. Doing so has not only tied the space in with the rest of the first floor, but has brought the space to life, literally! The last stop on the tour is our family room. It's upstairs away from all the action, where we can relax and watch a movie. I built the entertainment center last summer, but only recently finished it, as we were waiting for the custom made doors to be sent. Once we got them I had to find the time to paint them and install them, so it took a while. It was a personal challenge I presented to myself, to motivate me during a rough patch in my life. It surely did the job!! I came away from the project with so much more knowledge, and skill, and I can't wait to apply that to another project soon. This was also the first room in our home that I was able to decorate from scratch. We did a lot of bargain hunting for the pieces, so to see the final outcome looking as nice as it does, we couldn't be happier! 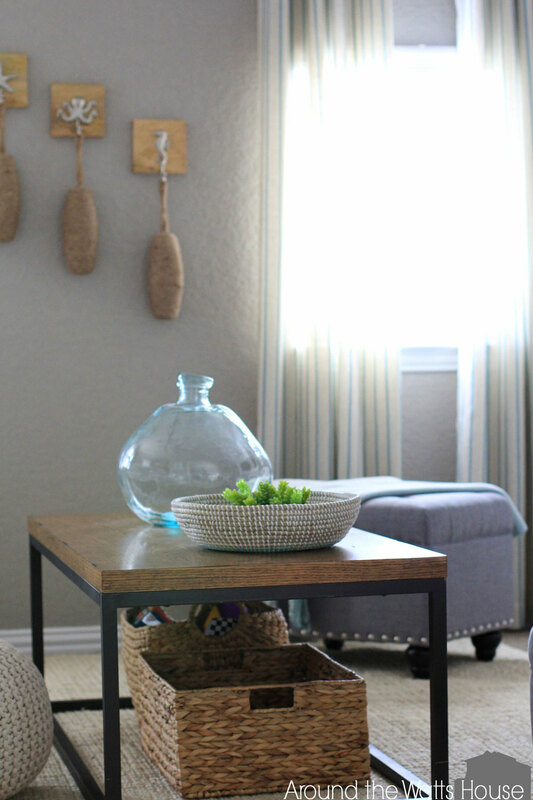 Of course I wanted to continue adding coastal décor to the house, so you will see that spread about. I also wanted to make sure the space was functional for our son to enjoy. His playroom is located right off of this room, but he still likes to run in and around the table, so I needed to make sure he had the room to do so without getting hurt, but allowing for extra seating for guests. So far this layout has worked well for us! I hope you enjoyed this tour of our home! It has been a labor of love, decorating it on my own, and has opened my eyes up to the idea of becoming an interior designer one day. I'm very excited about that prospect, but in the mean time I will continue to work on our home, and hope to share it with you all, as I do! I'd love for you to follow along with me on my blog, as well as my Instagram account, to see my ideas and updates as I continue on this journey. Stop by and say hello if you get a chance!